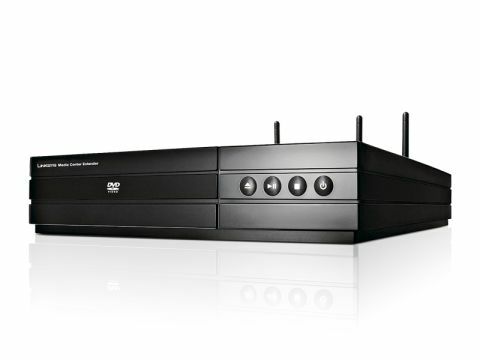 Linksys, a division of Cisco Systems – the supplier of just about everything technical at Jack Bauer's CTU (and don't we know it) – has released the first official Media Center extenders in the UK (Xbox 360-excepted) and the DMA2200 is unique in that it also contains an upscaling DVD player. By including it somewhere in the chain of your home network, via wi-fi or Ethernet, the media receiver hooks up with your computer (as long as it's running Media Center on Vista or Windows XP) and, using exactly the same front-end as MCE, can access all of the same files, functions and digital television controls. You can record TV, watch video, look at pictures, play music, even stream high-definition content, such as WMV HD files, essentially do anything that your media centre PC can do, with the same fantastic graphical user interface. However, there's no hard drive, so all of the content is stored on the separate computer – this kit is for a second room. It's capable of streaming DivX and XviD video files as well as Microsoft-only formats, such as WMV. The Wi-Fi aspect is Dual band and therefore compatible with 802.11N as well as 802.11B. Picture quality is excellent through HDMI; upscales all sources to 1080p. Can be tricky to set up, and isn't compatible with MKV and other HD files.